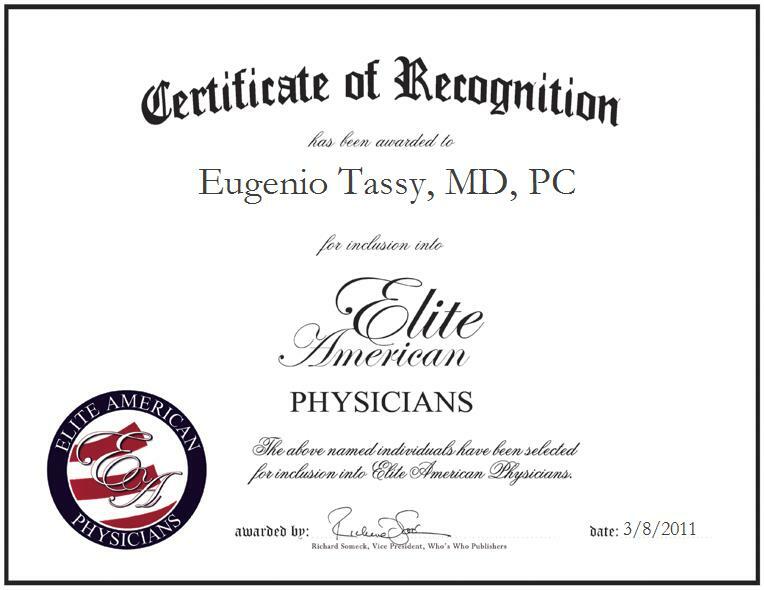 Bethpage, NY, February 18, 2011, Dr. Eugenio Tassy, Psychiatrist, has been recognized by Elite American Physicians for dedication, leadership and achievement in psychiatry. With 34 years of experience in the medical profession, Dr. Tassy is a respected specialist in mental health care. He has spent nearly two decades as the eponymous principal of Eugenio Tassy, MD, PC. In this capacity, he cares for patients suffering from depression, anxiety and substance abuse, conducts adolescent treatment programs, and offers consulting services to attorneys and various agencies. Dr. Tassy derives immense satisfaction from helping people improve their lives, and attributes his success to his earnest desire to be of service to others. An alumnus of New York University, Dr. Tassy completed residencies at Harlem Hospital Center and Nassau County Medical Center. He earned an MD in 1976 from the University of Haiti. In 2007, he was honored with inclusion in “Top Psychiatrists” by the Consumers’ Research Council of America. Active in his profession, he maintains affiliation with several organizations, including the New York Medical Society, the Bellevue Medical Society, the American Medical Association, the American Psychiatric Association, the American Academy of Addiction Psychiatry, the Haitian Medical Association, and the Haitian American Psychiatric Association. As he moves forward, Dr. Tassy aspires to venture into academia as a teacher and lecturer.